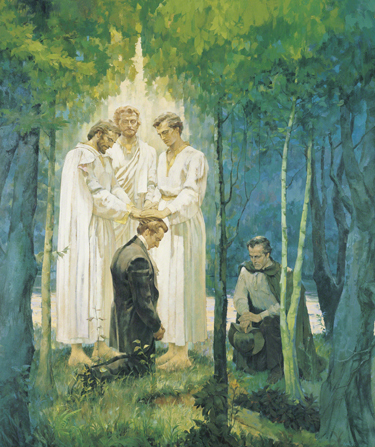 Life's Journey To Perfection: 2016 LDS Sharing Time Ideas for May Week 4: The priesthood has been restored. May Week 4 Topic: The priesthood has been restored. To begin primary, show the primary children a container with some small treats or prize (like stickers) inside. Ask the children if they would like some? Place the container into a gift sack and place a lock through it and close the lock. Ask the children if they have they keys to open the lock to enjoy what is inside? Show the picture of Christ ordaining his apostles. Explain that when Christ was on the earth the priesthood keys were on the earth. But when him and his apostles were killed, those keys were taken from the earth. Kind of like the treat being locked away. The people were unable to enjoy the blessings of the priesthood. Place the picture on the board and invite a primary child to come up. Hand a key to him/her that says Aaronic Priesthood. 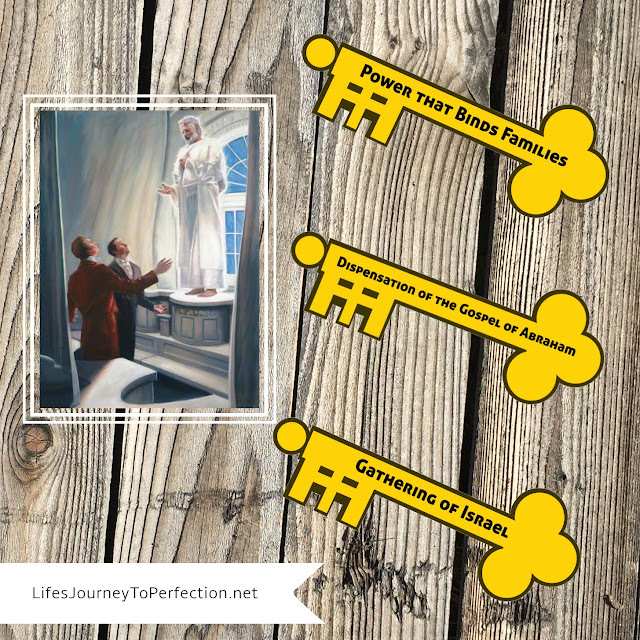 (see free download above) Invite the primary child to place it on the board next to the picture of the restoration of the Aaronic Priesthood. 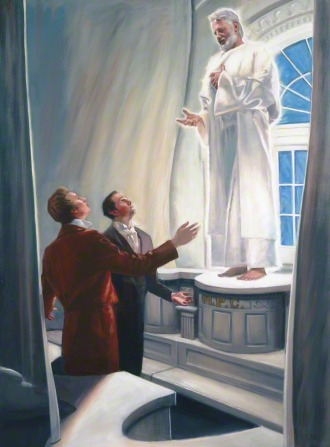 Next invite a primary child to come up and hold the picture of the Prophet Joseph Smith and Oliver Cowdery receiving the Melchizedek Priesthood. 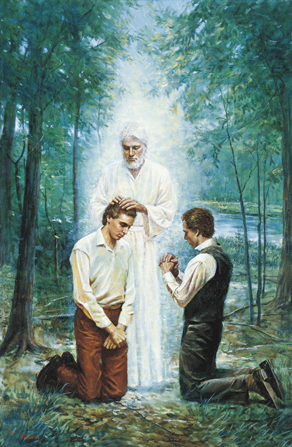 Ask the primary children if they know who ordained the Joseph Smith with the Melchizedek Priesthood? (Peter, James and John) Invite the primary children to share what they know about the Melchizedek Priesthood, how is it different from the Aaronic Priesthood? Discussion might include that the Melchizedek Priesthood is the high priesthood and holds more keys. Those who are ordained with the Melchizedek priesthood and live their life worthy can give blessings and confirm a person a member of the church and give them the Holy Ghost. Place the picture on the board and invite another primary child to come up and hand them another key that says Melchizedek priesthood. Have them place it on the board next to the picture of the restoration of the Melchizedek priesthood. Next, invite a primary child to come up an hod the picture of the restoration of the keys in the Kirtland Temple. Invite the primary children to look up, D&C 110:11-16. Invite a primary child to read the scripture. Explain that in the Kirtland temple, three prophets appeared to Joseph Smith, restoring some important priesthood keys. Discuss with the children, that Moses restored the keys of the gathering of Israel. Elias restored the keys of "committed the dispensation of the gospel of Abraham", which can only be fulfilled through temple covenants. Lastly, Elijah restored the keys of sealing, the power that binds families. Place the picture on the board and invite three primary children to come up. Hand them the keys that say, "Gathering of Israel", "Dispensation of the Gospel of Abraham", and "Power that Binds Families". Invite them to place the keys on the board next to the picture of the keys being restored in the Kirtland temple. 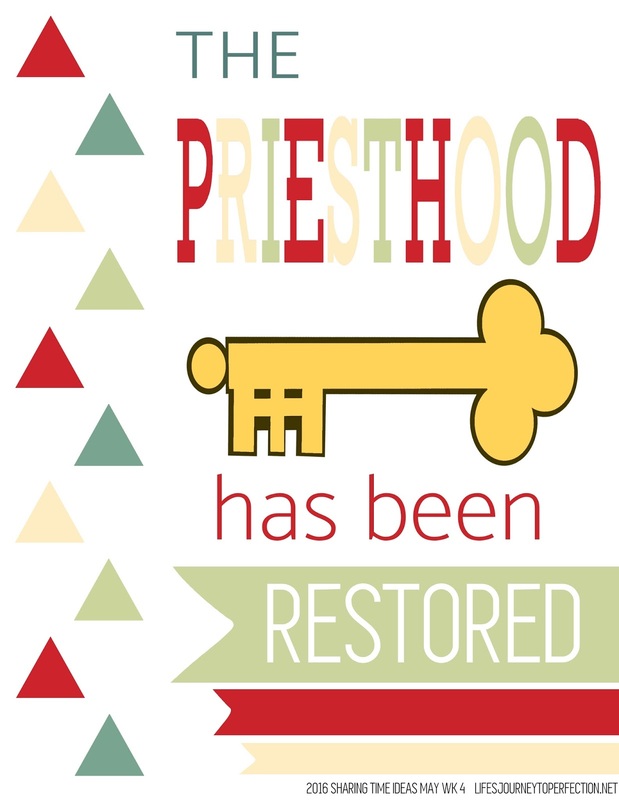 Show the primary children the week's theme poster and invite them to repeat, "The Priesthood has been restored". Explain that because the priesthood has been restored we are able to enjoy those blessings. Show the primary children the key that opens the lock on the bag. Open the lock and let the children enjoy the blessing that come from it. Close by sharing any additional thoughts you might have. SO many great ideas! This makes me miss my calling in primary!!! You rock. Love the keys! I might steal them for one of my lessons. This would be a great lesson to do for FHE too combined with Elder Stevenson's talk about Priesthood keys. Thanks Kim! Thanks Camille! I agree, I loved that talk!! I love your site and all the ideas you post! I am so glad I stumbled upon it!! I was just curious if you post a week 5 lesson when there are 5 weeks in a month?